E-cigarettes has quickly become a world-wide trend with users all across the globe. What does the law say about e-cigarettes? Just like with any activity, there are certain unspoken social rules that you’re expected to follow when vaping. While vaping in the comfort of your own home is pretty much fair game, there are certain restrictions on where and how you can do it in public places depending on local laws and attitudes. In some professions, vaping at work might be totally cool while in others it could be a sign of unprofessionalism. It’s all about knowing where to draw the line. Why is vaping etiquette important? Basically, vaping is the new kid on the block and doesn’t need to make any enemies. Some jurisdictions have already introduced legislation restricting the sale and use of vape pens and e-cig juice. As a vaper, the best thing you can do is to behave responsibly and respectfully around those who don’t partake. In some circles, vapers already have a bad reputation for being obnoxious with their habit and you should try not to contribute to this negative stereotype. Being a good vaper means there’s less likely to be a demand for restrictions on your behaviour and the behaviour of vapers in general. 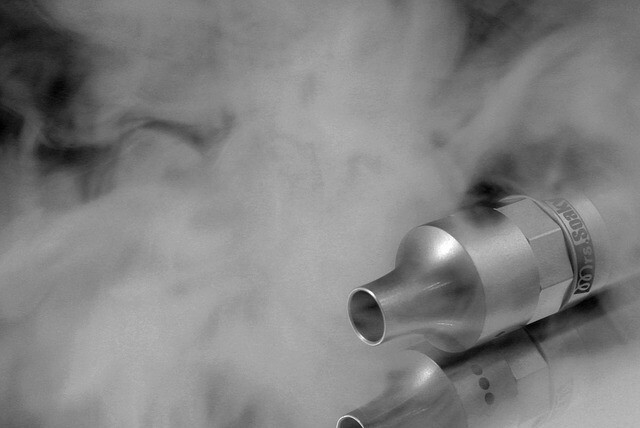 Let’s take a look at some common contexts in which vaping may or may not be appropriate. Go crazy! After all, it’s your house, your rules. Unless you’re sharing accommodation with others who dislike it, there shouldn’t be any restriction on how you vape indoors in your own residence. If you have guests over, be sure to make sure they’re ok with you vaping in front of them and be ready to explain it to someone who might not understand what you’re doing. Generally, vaping while driving is looked down on as it’s seen as a distracting behaviour. Not only that, but vapour clouds can be quite obstructive to your vision while driving and pose a real danger of causing an accident. Outdoors is the perfect place to vape, depending on where you are of course! For example, if you’re on a park bench or a country road, go wild! However, if you’re walking down a busy street or near a group of schoolchildren, an elderly person or pet then maybe it’s best to refrain from puffing until you find a clearing. All of the advice above can be boiled down into rules of common decency when partaking in any activity that might affect others. If people don’t want to experience and smell your vapour, you have to respect that just as you would expect them to respect you in the same way. Hopefully you’re now a little more conscious of your vaping etiquette so that you can enjoy your new habit without disturbing others. Selling tobacco products or e-cigarettes to persons under 18 years of age is a criminal offence. It is illegal to purchase a tobacco product for use by a person under 18. Our products don't contain nicotine. Call Quitline 131 848, talk to your doctor or pharmacist in order to quit smoking. You must be over 18 years old to access our website, are you? OK Please select your birthdate You are too young to visit our page, please leave our website.